The Friends of Rocky Fork State Park (TN​) are proud stewards and supporters of the Park and Watershed. Our ​purpose as a 501(c)(3) nonprofit organization is to support and assist the Rocky Fork State Park management and staff in their efforts to protect, preserve, promote, and enhance Rocky Fork State Park, including coordinating with other organizations responsible for the Rock Fork watershed as it affects Rocky Fork State Park. Nature calls. How will you answer? Assisting with the park sponsored special events and educational programs. Assisting park staff with trail improvement & maintenance projects, exotic-invasive plant removal, stream clean-ups, etc. Every 3rd Saturday of each month (Except Dec.), there is a Volunteer Day from 8 AM - Noon. Other Special Trail Volunteer Opportunities are available. Conducting fundraisers, assisting the park staff with grants, and accepting donations to help support and assist the park. 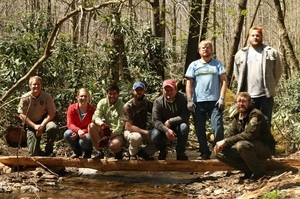 Some of Friends of RFSP Volunteers and the Rocky Fork Trail Crew Efforts and Accomplishments. The Rocky Fork State Park has developed an Official Trail Map. There are two versions of the ​Official Trail Map. The geo-referenced Official RFSP Trail Map will show your exact location. When the map is opened with an app on your smart phone, a dot/reference point displays on the device screen at your exact location. These maps use your GPS, not your cell signal, so they work even when you do not have service. Click on "OFFICIAL RFSP TRAIL MAP (GEO-REFERENCED VERSION)..." Button below for instructions to access map and free app. There is also a Printable Version of the Official RFSP Trail Map. Be sure to select your print option that fits the image to your page.